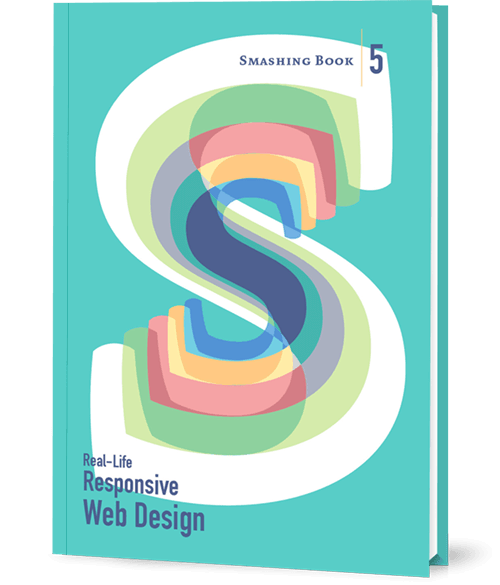 Smart “responsive” workflows, effective responsive design/UX patterns and powerful front-end techniques — if you need a good book on smart responsive design, our brand new Smashing Book 5 is just what you need. Neatly packed in a gorgeous hardcover, it covers time-saving, practical techniques for crafting fast, maintainable and scalable responsive websites. 584 (!) pages. Hardcover/eBook. 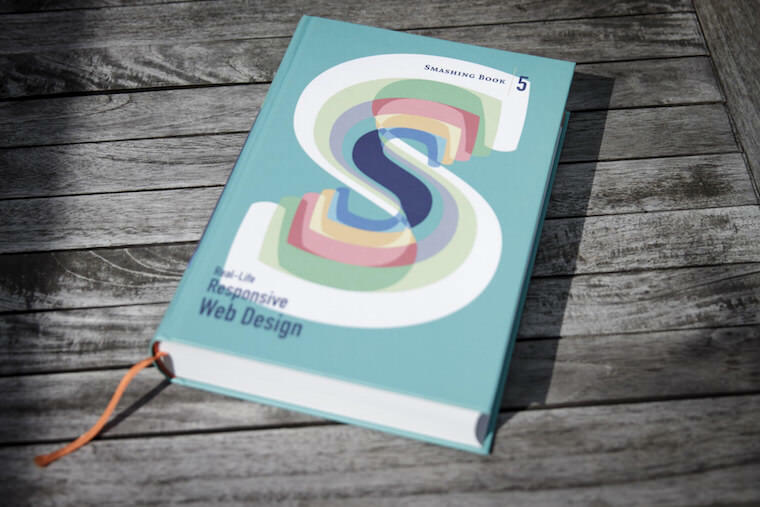 Smart “responsive” workflows, effective responsive design/UX patterns and powerful front-end techniques — if you need a good book on smart responsive design, our brand new Smashing Book 5 is just what you need. Neatly packed in a gorgeous hardcover, it covers time-saving, practical techniques for crafting fast, maintainable and scalable responsive websites. 584 pages, hardcover. Free worldwide airmail shipping. Get the book. Just like all of our Smashing Books, the book isn’t concerned with trends or short-lived workarounds. It focuses on the actual design process — the why of the decisions we make as we craft websites. Think of it as a reliable playbook for issues that keep popping up in every responsive project — just the playbook you need to master all the tricky facets and hurdles of responsive design. This book won’t solve every single issue in your responsive projects, but it will help you deal with common challenges effectively: be it front-end architecture, layout issues, resolution-independent assets, performance issues, responsive images or pretty much everything else related to responsive design. Shipping worldwide. Available as print and eBook. We invited respected designers and developers who know a thing or two about designing and building responsive websites. The chapters have also been reviewed by active members of the community such as Jake Archibald and Dmitry Baranovsky — just to name a few. Summary • As designers and developers, we solve problems for a living. Yet, these problems are often quite tricky and complex, and the context of these problems requires us to be creative and flexible in our workflows. With responsive design, we are prompted to create scalable design systems that work well in unpredictable environments. To do that, we need to be pragmatic and find solutions that work well within given constraints. That’s why we created this book: to find techniques that have actually worked in real-life projects with real-world challenges. Summary • In practice, responsive projects usually require more time, more skills, more testing and hence more flexibility in budgets. Addings changes late delays projects immensely, and process involving designers, developers and clients is usually tiring to say the least. In this chapter, Daniel shares insights into his responsive design workflow from projects such as TechCrunch, Entertainment Weekly and Radio Liberty, with techniques and strategies that help him get things done well, within budget and on time (most of the time), while achieving the highest level of fidelity in shortest amount of time. Summary • So, how do we deal with complex tables when building responsive websites? What about advanced interface components? Dashboards? What about the behaviour of web forms, navigation, mega-drop down menus, filters? Can we utilize vertical media queries and portrait/landscape orientation change? In this chapter, Vitaly will provide an overview of clever practical techniques for improving UX of responsive sites, with innovative approaches to designing "responsive modules" such as mega-drop downs, tables, calendars, accordions, maps, sliders, responsive PDF and responsive iconography — and a dash of anti-patterns to avoid as well. Keywords • design patterns • navigation • smart front-end techniques • priority+ pattern • improved off-canvas • lazy loading • autocomplete • filters • responsive PDF • portrait/landscape mode • sliders • country selector • responsive iconography. Summary • Content created by one department is never updated by the next. Services get renamed in the navigation, but are still referenced by the old name in the body text. Important information is buried in the murky depths of flowery prose. Sounds familiar? Many issues in responsive projects aren't related to technology, but to content: it's either ill-formatted or priorities get lost across screen resolutions. Let's fix it. In this chapter, Eileen shows how structured content can help refocus on what matters, and how we as designers can use the structure intelligently to provide users with information that they need, when they need it. Summary • This chapter has hands down on everything you need to know in order to start designing and building flexible components and visual assets with SVG. Sara will take you on a journey through SVG syntax, SVG accessibility, SVG viewport and viewBox, creating and exporting SVGs, embedding SVGs, building SVG sprites, creating SVG icon systems, using SVG Data URIs, optimizing SVG for performance, SVG conditional processing, clever SVG tricks and techniques and making SVG cross-browser responsive with CSS. 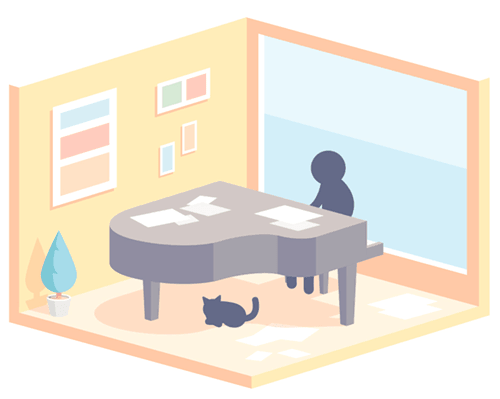 Yep, everything you need to know about SVG, as promised. Summary • We can use Flexbox for a while now. In fact, Flexbox solves a lot of CSS shortcomings and makes building responsive layouts much easier than with floats or positioning. It gives you more control over the things you care about in a responsive layout (such as order, alignment, and proportional sizes of your boxes) and lets the browser figure out the rest; the math-y stuff that computers are good at, like the exact dimensions that are needed on the boxes to perfectly fill the available space. Zoe shares insights from her work at Booking.com, showing practical Flexbox-based techniques which make responsive sites much easier to build and maintain — even without media queries. Summary • By default, web fonts block rendering, hiding content from the user. The only way to make content accessible as soon as possible is by treating web fonts as a progressive enhancement. This doesn’t mean web font performance is not an issue. You still need to load web fonts as quickly as possible so that users experience your site exactly how you designed and built it. Let's fix this. 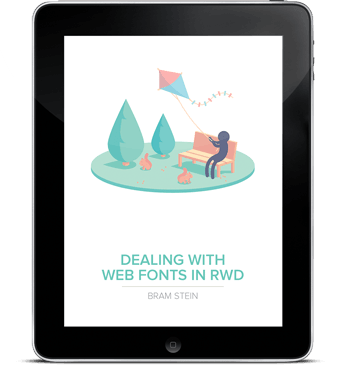 In this chapter, Bram shares insights that he has learned from working at Typekit, covering web fonts and formats, font loading and font rendering, CSS Font Loading API, fallback fonts, caching, compression, inlining, subsetting and font loading strategies. Summary • So you want to serve different images to different screens. Perhaps a Retina image (only) to Retina screens, or an art-directed image to small screens, or a portrait image for portrait orientation, or perhaps .webp to browsers supporting the format — without performance hits. Since images are the heaviest assets on the web, dealing with them intelligently is both our responsibility and opportunity for more dynamic layouts. That's what native responsive images are for. In this chapter, Yoav discusses the different responsive images use cases and how we can use the native solution today to create performant responsive websites. We will also look at ways to make these solutions easier to deploy and maintain in real projects, with Picturefill and CMS plugins for Drupal and WordPress. Summary • Explaining responsive HTML email is always an uphill battle, because just about every single designer and developer hates it. But there’s a lot of great, forward-looking innovation going on in the email design world. In fact, melding of responsive design techniques is absolutely possible. In this chapter, Fabio, the technical email maestro from Mailchimp, explores what you can achieve with media queries in responsive HTML email to ensure that your emails look just fine on major email clients across different devices, and looks even better in clients that do not support media queries (such as Gmail). Summary • We talk a lot about designing and building responsive websites, but not so much about maintaining and testing them. Speaking from his experience at BBC, Tom has built up a way of working that minimizes the pain points that responsive web design has. The chapter shows how you can build future-friendly CSS that will scale up to support large responsive websites; get you to take testing seriously, but not overcomplicate your workflow; and finally, how to sanely prioritize and debug common problems (layout, images, complex UI components like tables) in all kinds of devices and browsers. Summary • Our responsive designs lack soul. You can think of many websites that are well presented, easy to use, triumphs of UX and technically competent, but few that might be remembered for years to come. Why do you think this is? Why are so few websites memorable? Could the design processes we’ve come to rely on, particularly in relation to responsive design, have hindered our creativity? Our modern web design magazines are full of advice about process, techniques and tools, but little about creativity, about humanity, or about ideas. In this chapter, Andrew takes a closer look at how we can combine creativity with predictable design systems to create unpredictable, dynamic and memorable responsive websites — with a framework and a mindset that will challenge you to think differently about crafting websites today. Summary • What if we told you that as a user, you don’t have to be online to use the web, and a website or a web application would respond to this accordingly? Think Offline First: "We can’t keep building apps with the desktop mindset of permanent, fast connectivity, where a temporary disconnection or slow service is regarded as a problem and communicated as an error." John and Matt cover main technologies and practices that you’ll need to use to make your apps work as well offline, as they do online. We’ll discuss how to detect if we are online or not, HTML5 Application Cache, WebStorage and offline events, but most importantly Service Workers and how we can use them today to not only make content available offline, but also significantly improve performance and create snappy, fast experiences in (almost) no time. Summary • Design deliverable is one thing, an efficient collaboration between teams and stakeholders is a different beast entirely. This chapter provides strategies for keeping this collaboration sane and focused. You'll learn how to build a good and efficient team, how to establish good pricing/time estimates for responsive projects, how to establish priorities with content priority guides and how to shift away from linear handoffs with multidisciplinary teams. A detailed chapter on getting things done, with clients, the proper way. Summary • If somebody tells you that responsive websites are bloated, heavy and slow by default, and that it's very difficult to make them fast, don't believe them — they are liars. If you set the priorities right and build the website with progressive enhancement in mind, you can create extremely fast responsive websites that work well across devices: with one code base working everywhere. In this chapter, yours truly will be sharing what we’ve learned over the last year about the performance challenges of this very website and about the work we’ve done in-house in big and small companies. If you want to craft a fast responsive website, you might find a few interesting nuggets worth considering. From left to right: Daniel Mall, Ben Callahan, Eileen Webb, Sara Soueidan, Zoe M. Gillenwater, Bram Stein, Yoav Weiss, Fabio Carneiro, Tom Maslen, Andrew Clarke, John Allsopp, Matt Gaunt and yours truly. 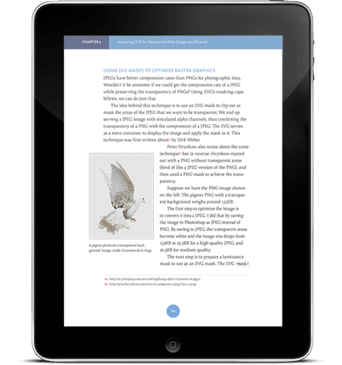 The eBook contains PDF, EPUB, and Kindle. Available as print or eBook. All our dear Smashing Library subscribers will find the Smashing Book 5 eBook in their dashboard. All printed books are being shipped from Germany via free airmail shipping. Yay! Test, maintain and debug responsive sites. Avoid generic solutions and stay creative with RWD. Add Your Name Into The Book! The Smashing Book 5 is being written and will be published in the spirit of our fantastic community — written by designers and developers for people like you, designers and developers who care about their craft. This book wouldn’t exist without your kind support. That’s why, just like with our previous Smashing books, we kindly invite(d) you to submit your name into the book. All spots have been reserved — thank you for joining in! Just about 1,500 names will fit properly on the two dedicated pages, so please don’t wait too long. First come, first served! Please also avoid grammar mistakes or blatant advertising. Thank you again for your kind support throughout the years, our dearest readers! There's no shipping costs for Smashing Book5 or all orders above $20 — wherever you are in the world! We ship everywhere worldwide. We are paying a share of the shipping costs ourselves to make it possible for anyone to purchase the book. Our prices are transparent: we don’t have any hidden costs, and we won’t confuse you with tricky calculations. What you see is what you pay. All books will be shipped via airmail to keep delivery times as short as possible. You can find the anticipated delivery time for your country in the delivery times overview. Shipping has started mid-July 2015. Is Smashing Book 5 available as an eBook? Yep, sure. The book is available in PDF, ePub and Amazon Kindle formats.